The President was returning from the then Upper Volta, now known as Burkina Faso, after peace talks and to negotiate among others, for the construction of the Volta Dam, with the then Upper Volta President- Maurice Yameogo. He decided to make a stop-over at Kulungugu, to acknowledge the chiefs, school children and people of this village, who had line-up in waiting for hours under scorching sun to meet him. During this reception, a bomb that had been shrouded in a bouquet of flower was given to a young school pupil, to be presented to the Osagyefo on behalf of the people, exploded, injurig the schoolgirl. 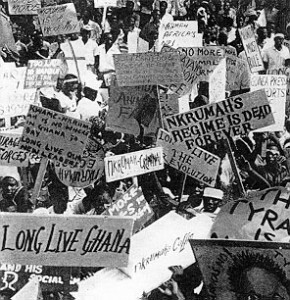 This ignited emergency security measures that were to be unpopular with many Ghanaians. JusticeGhana Editors Note: At COMMENTARY- and at paragraph four(4)we earlier reported that a bomb that had been shrouded in a bouquet of flower was given to a young school pupil, to be presented to the Osagyefo on behalf of the people, exploded, killing the schoolgirl. The "killing should have read: "injuring". The schoolgirl has been identified as Elizabeth Asantewaa who is still alive. Sorry for any inconvenience caused. Thank you.